Denture adhesive products are used to ensure your temporary dentures are fixed firmly in place. 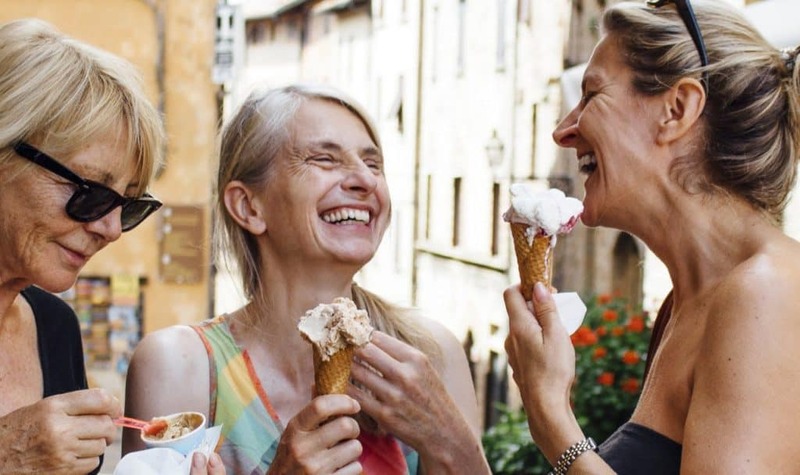 They are an important part of your dental health routine and offer denture wearers freedom to eat, speak, and smile without feeling uncomfortable. Choosing the right kind of denture adhesive makes life with dentures so much easier! We know that, when there is so much choice out there, it can be hard to pick just one product to try out. How do you tell a good product from a bad one? And how much should you spend on this essential part of your oral health? Is an investment even worth it? Who should go out right now and get them? Who Are Denture Adhesive Products For? Denture adhesives come in different shapes and sizes. They vary in how you apply them, how much they cost, and how effective they are in the long run. However, there is one thing they all have in common: their goal is to hold dentures in place. So, who would need them? Anyone who has ever had their teeth removed knows how uncomfortable immediate dentures can be. They leave their wearers’ gums chaffed and sore and are a pain to wear in the day-to-day. Even eating can become a hassle! If you are a habitual denture wearer and don’t plan on getting dental implants anytime soon, we can’t recommend more. Even if you wear a partial implant, these products would still be a great addition to your life! Not Even Perfectly Fitted Dentures Last a Lifetime! Unfortunately, not even perfectly fitting dentures last forever. With time, they start to get too loose and holding them in place without the help of a dental adhesive becomes nearly impossible. Think back of the last time you went to the orthodontist to get your teeth fitted. Was it right after you lost all or some of your teeth? If that happened a long time ago, it might be time for another consultation to get them fitted again. But in the meantime, dental glues, powders, and glues should tie you over until your next trip to the dentist. So, as you can see, if you’re expecting to continue leading a normal life eating and drinking what you feel like, these products are extremely important! Although they do all have one common goal, not all denture adhesives are created the same. There are three major options out there: adhesive cream, adhesive powder, and adhesive strips. The most popular (and cheapest) personal care item for denture wearers is probably the adhesive cream. It is also known as glue, bonding cream, or dental adhesive paste. They are easy to apply and are commonly found in most supermarkets and other retail stores. This oral care essential comes in a tube, just like toothpaste does. You are supposed to apply the adhesive cream directly on the part of the denture that comes into contact with your gums. This can be done with a wet or dry mouth, although reviews tend to suggest applying the glue when they’re damp. If there is one downside to the adhesive cream is that they can ooze to the sides when applied. Even if you align your dentures perfectly, there isn’t much you can do to stop spillage from the sides. If oozing dental adhesive sounds bad to you, then getting an adhesive powder might be a good solution. This product comes in powder form and should be sprinkled directly on the surface of the dentures. It works like a charm if you first wet your set of teeth and only then apply the thin coat of powder. A great upside to this kind of dental adhesive is that they are easy to clean and don’t make a mess — in your mouth or when you take your dentures off. Plus, they aren’t the most expensive product out there. But no product is without a downside… Some reviewers report having to reapply the powder more than once a day because their saliva dilutes the bonding elements. We’re convinced that this may be an application issue, but if you’re looking for a low-maintenance comfort seal, you might need to do some research. The last type of adhesive that will hold your teeth in place is the dental strips. These are the latest product to hit the shelves and also the most expensive. However, it has already garnered a lot of fans due to how unnoticeable they are. This product is also known as dental cushions, pads, or wafers. While they do require you to cut the strips into custom-sized pieces, this also means you will probably get the best comfort seal out of them. If you don’t mind spending a bit of time (and money) every morning trimming your adhesive strips, they might be the best option for you! By now you know that there are essentially three types of oral care adhesive products to choose from. 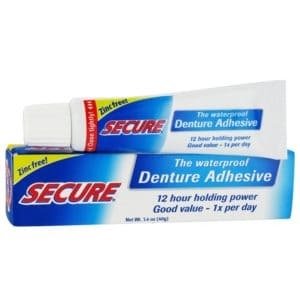 As if that weren’t enough to think about, we now introduce the top ten best denture adhesive items on the market. We have compared several of their features, including ease of application, availability, price, and, of course, how effective they are. 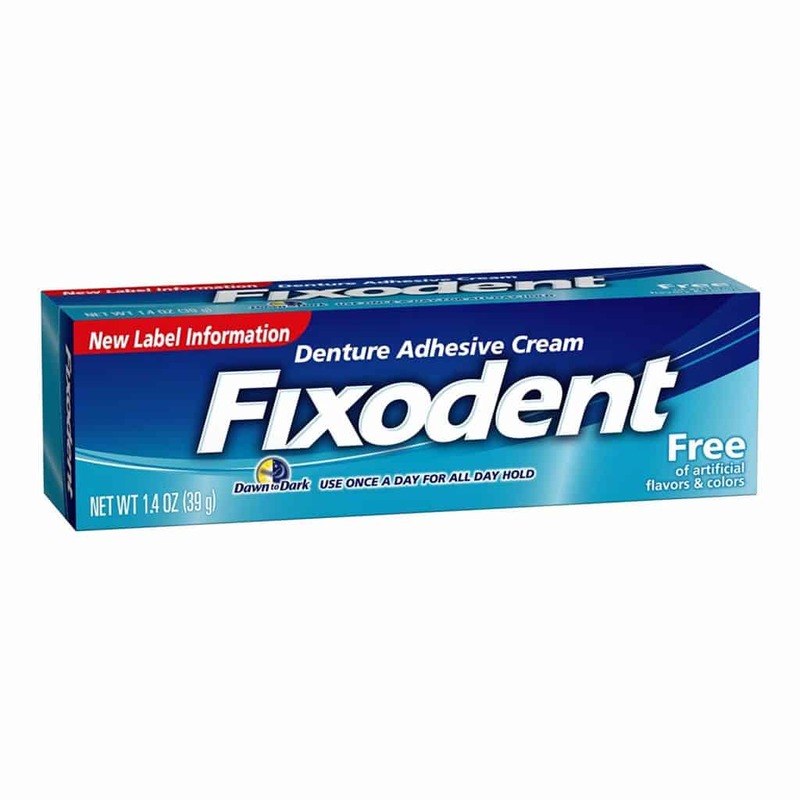 The Fixodent Complete cream for free dentures promises an all-day strong hold. Its active ingredients react with water to create a tight seal between the dental plate and your gums. This way, no food or water get between the two, and so the bond holds in place for longer. Since the cream is not flavored, you won’t feel that odd taste in your mouth that other creams leave you with. It may also comfort you to know that this is the number one choice of dentists all over America. If you’re not satisfied with the product, you will get your money back within 60 days. Since a 1.4-ounce tube (the smallest) lasts between four to five weeks, you’ll have enough time to try it out. Super Poligrip’s solution to ill-fitting dental plates is this zinc-free cream formula. It has no flavorings or colorings added, which is a good thing. The formula acts together with saliva to create a 12-hour-long strong hold that seals out about 74% of all food particles. You only need to apply two to three pea-sized squirts of the product. 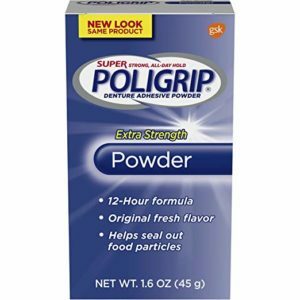 Since the Super Poligrip forms a strong bond, you don’t need to apply the product more than once a day. The zinc-free aspect is very important, as this chemical can have detrimental effects on your health. Especially if you use a sealing cream every day. 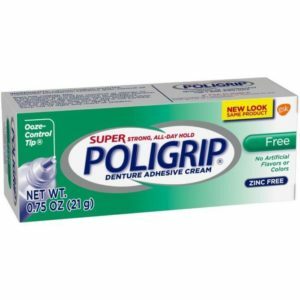 On top of this, customer reviews are very positive and the consensus is that dentures do, in fact, hold in place for the whole day when using the Super Poligrip denture adhesive cream. This zinc-free cream holds dentures in place for an entire day. The 12-hour strong bond advertised works wonder according to hundreds of Amazon customers. Many even report that removing their dental plates is sometimes a challenge due to the strong hold! The only small disadvantage with this product is that you can’t eat or drink within 15 to 30 minutes after applying the product. This may be what makes the seal bond so strong. As it is preservative-free, this is one of the best oral care products out there. The priciest item on our list is also one of the top rated products in oral care on Amazon and other online retailers. This comfort lining thermoplastic waterproof denture adhesive will make your plates stay in place for four days in a row. Since the product doesn’t wash off with water, the bond seal offered is long-lasting. This is probably the easiest product to use that requires the least maintenance. You can eat, drink, smile, laugh, and talk without worrying about your false teeth slipping out. 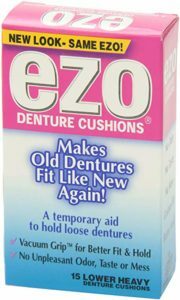 If creams aren’t your thing, the Ezo Denture Cushions are a perfect alternative. They make old false teeth stay in place and feel like new. The Ezo cushions make both lower and upper teeth adhere to the gums thanks to its vacuum-grip technique. When you use the Ezo Denture Cushions you can expect a strong seal bond for up to 24 hours, a figure far better than all creams on the market now. As they’re made of pure cotton flannel, paraffin oil, and corn oil, they won’t irritate your gums. They offer comfort, ease of use, and as a result have hundreds of satisfied customers. 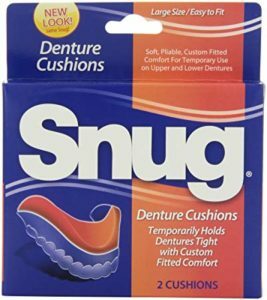 A good way of keeping your lower and upper dental plates in place for the whole day is to use the Snug Cushions. They are soft, malleable, and easy to adjust to the fit of your plate. Although cutting and molding the strips to your desired fit is a little time-consuming, they offer major comfort. The material is cotton-like and soft on your gums, reducing chafing drastically. Never has a company name fitted the product as well as it does with Snug. 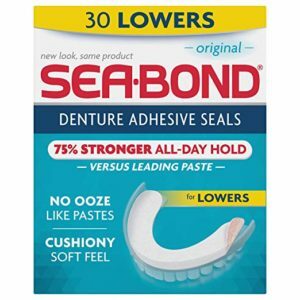 Sea Bond has created an easy-to-use pack of adhesive strips for prosthetic upper and lower teeth. You need to apply the U-shaped strip to your plate and trim off the excess fabric. Once you have your desired size, dampen it and bite down for five seconds. This product is effective for twelve hours straight and since it is unflavored, very discreet to both the user and any onlookers. 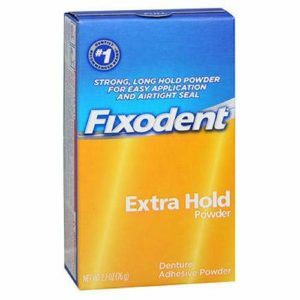 A great adhering powder on the market is the Fixodent Extra Hold Powder. Because it is a powder that is applied to moist plates, there is no oozing with this product. Plus, it seems to hold fake teeth in place for longer than most creams. The biggest downside is that the formula includes zinc in it. While it’s not a major concern, it’s something to take into consideration. Nonetheless, it’s highly recommended by oral care specialists and even has a money-back satisfaction guarantee. This newbie-friendly powder offers a 12-hour all-day seal bond between your plate and gums. Besides being easy to apply, it does a very good job at sealing out food particles. Plus, the formula doesn’t contain any zinc in it. If going to the dentist’s office to get your dental plates relined isn’t for you, you’re not alone. 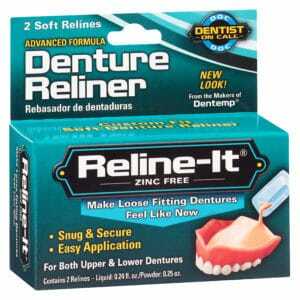 So many people are in the same boat as you to the point that Reline-It came up with an incredible and affordable DIY denture relining kit. To get the most out of this product, follow the manufacturer’s instructions. It is a great alternative to getting your plates professionally relined. If you do everything right, your dentures will be like new and stay that way for weeks. When looking for an adhesive product, be it a cream, a powder, or strips, there are some things to keep in mind. Knowing what makes the best dental adhesive will help you choose the right product for you. With so many to choose from, this checklist will definitely come in handy when making a decision. The most important thing is bond strength. You want to get a product that offers an all-day hold comfort seal between your gums and your dentures. The stronger the bond, the more natural your artificial set of teeth will feel, and the fewer times you will have to reapply the product, and the less sore your gums will feel. Secondly, judge how easy to use and clean each product would be. You want one that is convenient and doesn’t make much of a mess at night when you take your prosthetic teeth off. It’s oral care, not rocket science! Thirdly, choose a product that you would feel comfortable using. Some products are flavored, while others have a texture it takes some people a while to get used it. Choose whichever one makes you feel good! Another very important point to keep in mind is the zinc levels of the cream, powder, or strips. High levels of zinc can cause big health problems, so it is wise to opt for zinc-free products. Lastly, it’s all about the cost. You will find dental adhesives at virtually all price points. However, not all of them last the same amount of time. Take into consideration how many uses you can get out of a product and how much it costs. Once you compare those two parameters, you can make an informed decision! When compiling a list of all these products, we looked at the five things we mentioned above: bond strength, ease of use, comfortability, zinc levels, and cost. We also took into consideration how established the brand is, how many reviews there are on major consumer websites, and how good (or bad) they were. After all, no matter what the brands claim, the customer always has the final (and most honest!) say. In the end, we wanted to ensure that the products we recommend are safe, easy to use, comfortable to wear, and mask the fact that you’re wearing dentures. If you’ve been living with temporary or partial dentures, you know how annoying and uncomfortable they can get the more you wear them. Eating solid foods, drinking liquids, and even smiling can become quite difficult. Adhesive products were invented to fix all these problems. Their job is to fix your prosthetic teeth to the roof of your mouth and gums. Thanks to this, food particles won’t slip between your mouth and teeth anymore. Another added benefit is the comfort they bring to whoever wears them. Since the dentures stop moving around, the gums aren’t chaffed as much — a massive plus! Also, as the dental plate doesn’t fall down as it did before, wearing one feels almost like having real teeth. You will forget you are wearing a plate and other people won’t even notice! Lastly, using these adhesive products brings people a lot more freedom. When you wear false teeth, biting apples, eating sticky foods, and drinking hot beverages can be very uncomfortable, and oftentimes impossible! But dental glues, powders, and strips change this once and for all. When you use these products, you can eat just as you did before without having to worry about the dental plate falling off. It gives you back your freedom. If wearing dentures isn’t for you, not even after you have tried adhesive products, then you may want to entertain other options. The most popular one is also one of the most expensive, and that is getting dental implants. The process of having teeth implanted in your mouth starts off with a surgery. An orthodontist will put metal rods directly in the bone of your jaw. They stick out of the gums and then have fake teeth attached to them. The great thing about this procedure is that it’s permanent. There will be no need to take the prosthetic off at night and putting it back in in the morning. It’s just like having your own real teeth again! If there is one downside is the cost. Getting dental implants is very, very expensive. If you want to buy a full mouth of implants, it can cost dozens of dollars — if not more! This is the reason why most people choose life with dentures. As soon as you find the right product for you, you won’t feel like you have a temporary plate, but rather real teeth. It’s all about getting used to them! How to apply denture adhesive products? No matter the quality of the product you have, if you don’t know how to use it, then you won’t get results. This is true for computers, smartphones, televisions, printers, and, of course, denture adhesives. To get the most out of comfort seal products, you first need to know how they work, how to take care of them, and what not to do when wearing them. First of all, you need to follow the manufacturer’s instructions. This seems like a silly tip, but surprisingly not a lot of people follow it. Should you rinse your plate before applying it? Does the product work better when it’s moist or when it’s dry? The company who made your product surely answers all these questions and more on their packaging. Secondly, keep an eye out for how much adhesive you are using. Less is more, in this case. Applying too much cream, powder, or too many strips can weaken the strength of the bond. Start with smaller quantities and then adjust it to your needs. Then, you want to make sure to secure the plate with the product in place. The longer you bite down, the stronger the bond will be. Most companies recommend holding your teeth in place for around two minutes, so this is a good rule of thumb. Another important tip is to be flexible when reapplying the product. If you feel your teeth start to become loose, apply another layer of product. Even reapplication before meals is a smart move. Don’t be afraid to try out different application schedules until you know what works. One last piece of advice a lot of people forget about is properly cleaning their prosthetic. Just as you should brush your teeth every night, you should clean your dentures before you go to bed too. This not only gets rid of any leftover product, making the next application more successful, but it also stops the plate from becoming smelly. Who wants to go around with bad breath? Oral care is a serious thing, even if you don’t have teeth anymore. Regardless of how well applied the plate is, food particles can still slip onto it and start to rot. And don’t forget, be patient but don’t be afraid to try a new product out! Knowing which is the best denture adhesive product for you will probably take a few tries. The key, then, is to be patient. Try each product more than just a handful amount of times. However, if it really does not work for you, pick out a different brand or type of adhesive and give that one a go! It all depends on what you look for in one. Some people don’t like having to apply powder. Others want to save time and don’t consider the strips at all. So you have to first decide which will be the best denture adhesive type product for you. Then, read our reviews and choose the one you like best! How to remove denture adhesive from gums? Since most formulas are water-soluble, swishing around warm water in your mouth will do the trick. Using mouthwash is also a great solution. Plus, it helps to get rid of the unpleasant smell that dental plates eventually create. If your adhesive is waterproof, then your best move is to follow the manufacturer’s instruction. Getting rid of cream or powder residue from your gums is just as easy. As soon as you’ve removed your plate, swab a warm, wet washcloth across your gums. The product will come out just like that. All the products are very safe! Although zinc-free products are preferable, even those that have zinc are safe to use. All creams, powders, and strips sold across the United States and through the biggest online retailers have been put through tests — and passed them. Can denture adhesive be used on partials? Yes, the best denture adhesive products hold partials just as well as they hold full dentures. They stop food particles from getting between both sets of prosthetic teeth in the same way they stop food particles from getting stuck on your gums. How much denture adhesive to use? Two to three pea-sized dollops of cream are usually all it takes to hold the plates in place. If you use powder, then the process is similar to that of flouring a cake pan. Add some powder evenly to the plate and shake it so as to get rid of any excess powder.